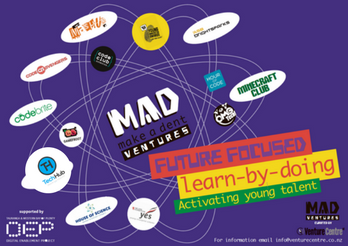 MADVentures is a curated suite of programmes, events, and workshops designed to support the digital and entrepreneurial capability of young people. The Digital and Entrepreneurship opportunities listed on this page are organised and delivered by Venture Centre. The Ecosystem opportunities also listed on this page are delivered by local and national organisations equally vested in supporting young people Make A Dent. Together these opportunities offer fantastic pathways to talent expression and success. There is no doubt the future is digital. These activities are designed to support children thrive in a digital era: to go from consuming digital content and applications to making them! Codebrite develops coding skills for children aged 8 to 13 with some or no previous experience with computer programming. The Hour of Code started as a one-hour introduction to computer science, designed to demystify "code", to show that anybody can learn the basics, and to broaden participation in the field of computer science. Some of its content is used alongside other activities during these popular tasters. A nationwide network of volunteer-led after school coding clubs for kiwi kids which is coordinated locally with the support of Venture Centre. Entrepreneurship gives young people the opportunity to plan their own destinies. Even if they don't start a business, youth involved in entrepreneurship programs gain skills and become more innovative and effective employees and managers. Do you see things in the world you want to change? Do you come up with new ideas but have to give up on them? Do you want to do something but don’t know how to make it happen? Mini Mashup is an ideation workshop designed to get you started and find people to help you along the way. A 48hr event to introduce those 14 years and over to entrepreneurial and technical skills necessary to solve problems in their community. Teams of four students develop a product idea, create a business plan and build a prototype with the help of expert mentors over the weekend. Are you part of a YES (Young Enterprise Scheme) team wanting to break even faster? Or part of a Mashup team wanting to continue working on your concept and take it to market? Check out the link to see what two programmes you can do to be paired with a business mentor from our local community. The Lion Foundation Young Enterprise Scheme (YES) is an experiential in-school programme where senior students set up and run a real business. The New Zealand digital and entrepreneurial ecosystem provides plenty of opportunities for young people getting started. Here is a selected list of activities that provide complementing pathways to those listed above. A better way to learn to code websites, apps, games and more. Develops & delivers engaging workshops for both teachers and students on digital technologies. Giving students a head start through technology. Local awards programme for students in Tauranga/Western Bay of Plenty to promote innovation. A nationwide education system that nurtures curiosity, by resourcing and connecting local science communities. Connects employers with top local students and graduates for paid work experience and graduate jobs. Offers a start-up accelerator experience for youth in New Zealand. Including grants, internships, and much much more!